What's the best juicer for juicing fruits? What's the best juicer to juice fruits? Many times, I am asked the question, "Which is the best juicer to juice fruits?". In general, I will respond with one word - none. In my opinion, a blender would be a more suitable appliance. Why would I give this answer? Hopefully this article will shed some light on this subject. There are several reasons why I recommend blending fruits instead of juicing them. I will cover one at a time. 2. Fruits are here on earth for us to eat whole and complete. Remember Adam and Eve? I personally believe fruits should be eaten whole, and enjoyed. My rule of thumb-- strive to eat ripe fruit, that is as fresh as possible. True ripe fruit tastes so much better than store bought produce. (Ever eat a hard peach that didn't have any flavor?) Most produce is picked unripe since it needs to be shipped long distances to get to the store near you.. If you are not able to pick your own, I highly suggest visiting local farmers markets and supporting local farmers. 3. Did you know that we need fiber in our diet? Fiber is not a large component of juice as compared to the original whole fruit. I believe fiber is essential in our diet. I mostly juice veggies, I need to get my fiber somewhere-- from the fruits! 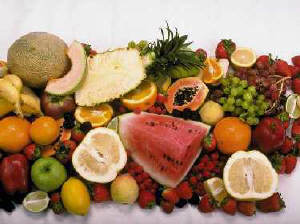 Did you know that the fiber in the fruit helps to regulate the absorption of the sugar in the fruit into our bodies? When you drink fruit juice, without the fiber, the sugar is not regulated... which I don't think is a good thing, unless you need a "quick pick-me-up" or something. What's the difference between blending and juicing? When juicing, the whole produce goes into the juice, and two things come out: the juice and the pulp (or fiber). When blending, the whole produce goes in, and you get the whole fruit out..Although it is in really, really, small pieces. If you were to eat a fruit, and chew it really, really good, the fruit would be in really, really small pieces, so blending is similar to eating the fruit and chewing it really, really well. When blending, you are still getting the WHOLE fruit, and thus, you are getting the food in more similar of a manner as nature has intended. You are also getting the important fiber that helps to regulate the absorption of sugar into our body. Here is a list of fruits that most juicers will juice fairly well. Fruits in the other column are best blended, since most juicers don't handle them well. Do I still juice fruits? Yes, I do.. Usually the fruits listed above that juice fairly well.. Although now days, you will catch me with a blended smoothie with fruits almost everyday!